is a philosopher, composer and sound-multimedia artist based in Livorno (Tuscany). His compositions have been published by Touch (UK), Radical Matters Ed/Label (IT), Actual Noise/20buckspin (US), Afe Records (IT), Boring Machines (IT), Old Europa Cafe (IT). He is working in Italy with the Enrico Fornello Contemporary Art Gallery. Riparbelli’s performances and installations have been presented at D’Amelio Terras contemporary art gallery (NY), Equinox Festival (London), Nuit Blanche (Paris), Magazzino d’arte moderna (Rome), Palazzo delle Papesse (Siena), Flora (Florence), Fundació Tàpies (Barcelona), Base progetti per l’arte (Florence). 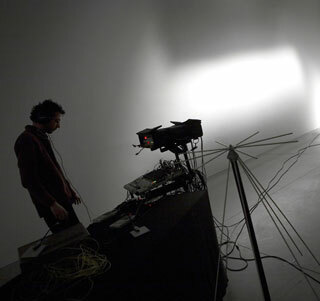 He works with performances, sound installations and recorded works and in the last three years has been collaborating through selected projects with Massimo Bartolini, Nico Vascellari, Philippe Petit, Fabrizio Modenese Palumbo, Influx, Francisco Lopez, L’Acephale, Christina Kubisch, Seth Cluett, Burial Hex, Yannick Franck and others. He is a curator/executive producer of the independent music label Radical Matters – Editions Label with the new series “Metasound” and he his the curator of the project AEDO “Curatorial and Sound Practice” to investigate the dimension between music and contemporary art.